Living Area: 3424 sq. ft. 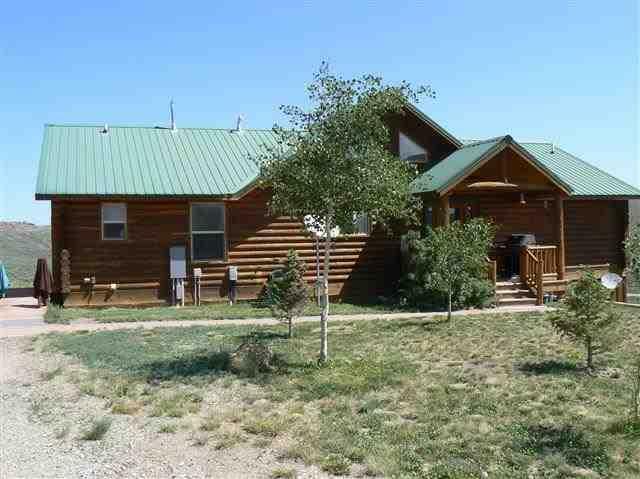 Spacious log home on 20+ acres with great views! Just minutes from Blue Mesa's Iola boat ramp. Property borders BLM, and has no covenants. Over 3,400 s.f. includes 4 bedrooms, 2.5 baths, with in-floor heat. Main floor master with walkout deck. Great room has woodstove, vaulted ceilings and deck. Kitchen with custom cherry cabinets and granite tile counters. Lower level has walkout family room with pool table, and three bedrooms. Plumbed for kitchenette too. Wine cellar, storage, and office. Detached garage wired for shop, and has woodstove. Includes hot tub, snow blower, log splitter and antler chandelier. Country living at its finest!